Home Gerald Anderson Jason Abalos Rayver Cruz Sam Milby The Avengers Video Viral Video YouTube YouTube Video Kapamilya Hunks Sam Milby, Rayver Cruz, Jason Abalos and Gerald Anderson's 'The Avengers' Doing Gangnam Style Video! Kapamilya Hunks Sam Milby, Rayver Cruz, Jason Abalos and Gerald Anderson's 'The Avengers' Doing Gangnam Style Video! Kapamilya hunks namely Gerald Anderson, Sam Milby, Rayver Cruz, and Jason Abalos together with Gerald's younger brother Kenneth performed the K-Pop global hit dance craze "Gangnam Style". But they did it wearing "The Avengers" costume! 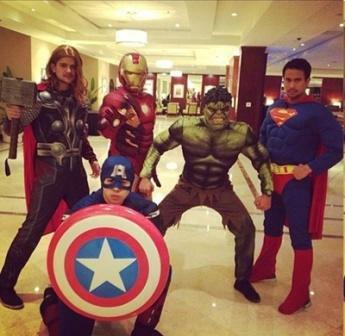 Rayver Cruz as Thor, Gerald Anderson as Iron Man, Kenneth Anderson as Captain America, Jason Abalos as The Hulk and Sam Milby as Superman. They call themselves “The Avergers” which is also the title of the viral video.